still dressing like it is winter. sigh. i tried out some of my new spring/summer clothing the other day. just in the house. for kicks. okay ... and to quell a worry. i worry (a little, not a lot) that, given the long, cold winter, i have lost touch with my spring/summer layering self. i worry that when it gets warm enough to bring out the spring/summer clothing (for real), i won't know how to dress. then again, and on a more optimistic note, sometimes a long period of winter layering inspires a "new" approach to spring/summer layering. i not only know how to dress for spring/summer, i am better at it than ever before. see: playing dress-up in the house with my new spring/summer clothing works! i am wearing the alpen top and the tokyo hat by kaliyana. 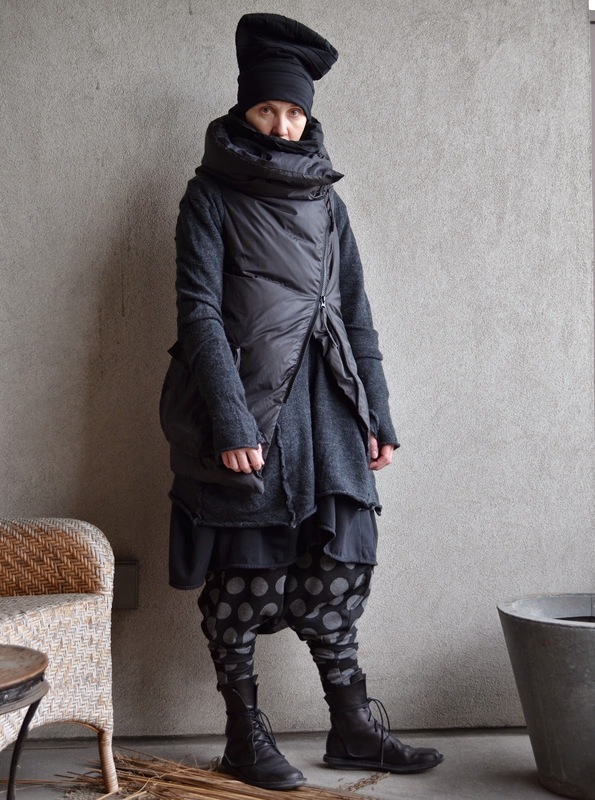 my pullover and vest are rundholz (black label). my dress and trousers are a local label (motion). i am wearing the rectangle boot (closed collection) by trippen. Summer shoes are the most difficult for me; Dayton boots are a bit toasty for the summer months. kimberley: oh my gosh! i think that you have anticipated a future post that i have been working on: finding the perfect-for-me summer shoe! i think that i have spent my entire life to date figuring out what to wear on my feet in the summer ... and be happy and comfortable with it. I am sorry you are cold, but this is gobsmackingly good!